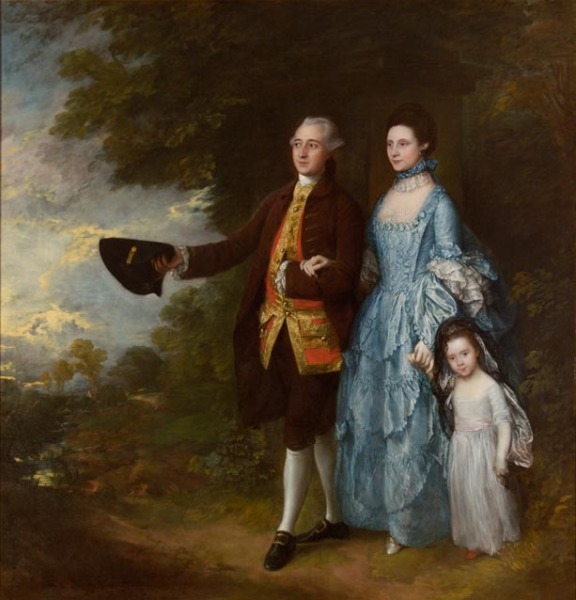 Framed Oil Painting: The Byam Family by Thomas Gainsborough (1727-1788), oil on canvas, c.1762-66. On long-term loan from the Andrew Brownsword Arts Foundation. One of the most ambitious paintings made during Gainsborough’s sixteen years in Bath, this portrait shows George Byam (1734-1779), a plantation owner from Antigua who married a local girl, Louisa Bathurst. The couple stroll in a poetic landscape, demonstrating their sensibility as admirers of nature. A few years later, the Byams returned to Bath with their first child Selina. Gainsborough added her to the portrait and took the opportunity to change the colour of Louisa’s gown at the same time.